Holistic medicine views the body's state of wellness as a whole, rather than as individually functioning components. Disease is a condition of imbalance in the body, resulting in the inability to maintain optimal health, especially when a stressor is introduced. If a single component is exhibiting symptoms of imbalance, a holistic practitioner would consider how other systems may be affected, and how that correlates with the individual's lifestyle. By supporting the entire body, often times disease can be reversed in the initial symptomatic area more effectively in the long term than if only the individual symptoms had been treated. The approach of traditional western medicine relies on pharmaceutical drugs to treat individual symptoms of imbalance. Most of these drugs have side effects that harm other areas of the body, creating further imbalance. The drugs usually just cover up symptoms by overriding the body's distress signals, ultimately making the underlying problems worse. Alternately, treatments with organic whole foods, supplements, energy modalities, and manual therapies support and repair the body by providing the building blocks that are necessary for optimal function. By the time symptoms of disease become clearly evident, the internal issues have usually been progressing for a significant period of time, and can take equally as long to reverse. Our bodies are also constantly bombarded by toxins that can slow down healing processes, so it is especially important to support the organs responsible for eliminating toxins. Holistic healing takes patience and persistence, which can be difficult for those trained to expect immediate results, but it is well worth it in the long run. What is this blog all about??? I am constantly home-schooling myself about nutrition (for people too! ), pet care, vaccine controversy, and all kinds of other holistic goodness! My hope is that by starting this blog, I can share the information that I learn with others who don't have the time to weed out the facts on their own. Feel free to let me know if there is a pet care topic you would like to know more about! 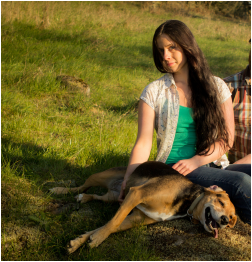 Certified Animal Massage Practitioner, independent-study nutritionist, holistic pet care advocate.